Get a Dooney & Bourke – How Can You Tell if it is Real or Fake? Dooney & Bourke is another American Brand Handbag Company that has joined the ranks of Coach by being, “Knocked Off” as they say in the business. For many years counterfeiting was something set aside for the big names and the foreign handbag market such as Louis Vuitton, Chanel, Dior and Gucci. As the handbag craze grew and brands such as Dooney & Bourke grew in popularity these bags began to find there way to the US counterfeit market. 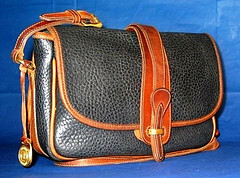 Dooney & Bourke started in 1975 when Peter Dooney and Fredrick Bourke started there line of handbags in South Norwak, Ct. In the early days they made belts and suspenders, then in 1981 they branched out into the handbag business. There first two big successes were the Tack Case and the Equestrian Bag, both of these bags were made from bridle leather. In 1983 there business really grew with the release of there line in the famous, “All Weather Leather”. Along with this collection came there recognizable logo the Duck, it emphasized the concept that water runs off these bags just like it runs off a ducks back. Many celebrities as well as groomed housewives and college coeds can be seen carrying these bags. These bags represent affordable luxury for everyone therefore creating the market for counterfeits. How can you spot a fake Dooney & Bourke? First you should look at the logo on the front of the bag and make sure the thread on the logo is the same color as the thread used on the rest of the bag. Then you should check the leather trim on the bag because it is always a british tan leather. You should also check the hardware because a real sign that it is fake is that the hardware is not actual brass because no visible metal should be silver. And finally you should look inside the bag there will always be the famous Duck Log with stitching and there will always be a visible red, white and blue registration number sewn in the bag. Remember when purchasing a Dooney & Bourke to be assured that it is Authentic it is best to purchase you bag from a major department store or an Authorized Retailer. Just because it looks good does not mean it is real. Roy Leadwell is an expert in the field of Fashion. Article Source: ArticlesBase.com – Get a Dooney & Bourke – How Can You Tell if it is Real or Fake?